The Spinone is a very ancient breed and it is believed to be one of the oldest gundogs in existence. The exact origins of the breed unknown but there are many different theories. Some of these claim that the Spinone could have originated in Italy, France, Spain, Russia, Greece, or Celtic Ireland. During the Second World War, the Spinone became close to extinction. Both the war and the fact that Italian hunters had begun using other breeds of dogs for hunting. 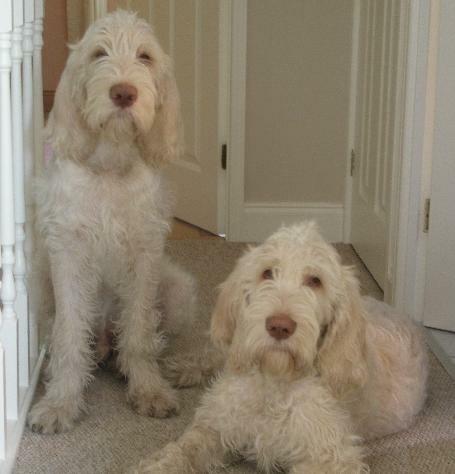 The breed was not officially known as "Spinone" until the early nineteenth century. Before then, some areas knew the breed as the "Spinoso". The dog was named after an Italian thorn bush, called Pino, which was a favorite hiding place for small game because for larger animals it was practically impenetrable. Only thick-skinned, coarse-haired animals could fight through the branches unharmed to locate the game, which was a specialty of the Spinone. In 2000, the Spinone Italiano was officially recognized by the AKC. A very smart and loyal dog, it is perfect for families with kids, who want an active, yet easy going dog that you can take for a jog or just lie down on in front of the TV. The breed is known as Italy's all-purpose hunting dog. Some say it is a cross between White Mastiff, French Griffon and the coarse-haired Italian Setter, bred with the dogs that were left by Greek traders and others from the Adriatic coast. However this is not proven and the dog's rather uncertain heritage centers around Europe and its gun dogs of long ago. Whether he was the basis for bringing forth other gun breeds, or whether they simply sprang from common stock is not known. The breed has excelled as a pointer and retriever for centuries. Today they are a popular hunting dog in other countries, as well as a pet. Happy to lay at your feet and relax or go for a great romp outdoors in parks. Not incredibly popular, so the genetics are pure and minimal inter-breeding, thereby perserving the breed.